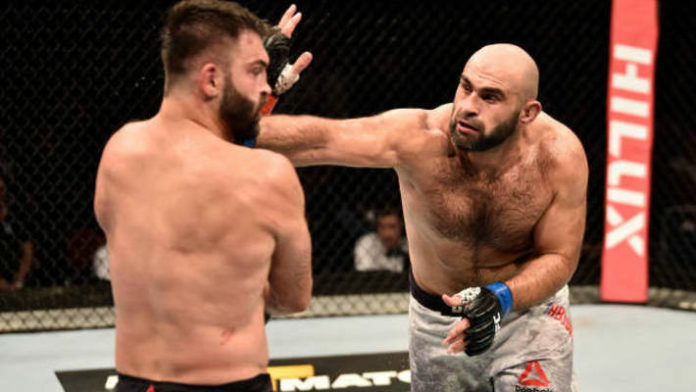 Shamil Abdurakhimov was hoping to finish Andrei Arlovski at UFC Moscow, but he’ll settle for the win. Abdurakhimov took on Arlovski on the main card of UFC Moscow. The event aired live on UFC Fight Pass. After three rounds of action, Abdurakhimov was awarded the unanimous decision victory. It’s “Abrek’s” second straight victory and now he is sure to improve his 14th spot on the official UFC heavyweight rankings. Abdurakhimov improves his professional mixed martial arts record to 19-4. He’s gone 4-1 in his last five outings. Abdurakhimov noted that he wants to fight anyone in the top six or top seven. It may be a tough sell as Abdurakhimov isn’t likely to be in the top ten despite the win over Arlovski. It certainly isn’t impossible, however. MMANews.com provided live coverage of UFC Moscow over the weekend. You can check out results, highlights, and post-fight tidbits by perusing through our homepage or using the search function. Who do you think Shamil Abdurakhimov should face next?